Shapes are everywhere! From clovers in your backyard to the octagon on the stop sign, shapes are something your child likely sees every day. You can help your child appreciate these sights by ensuring he knows the proper name for each shape and can easily identify each shape. Also, by learning to draw each shape your child will be able to express himself clearly through drawings. Fortunately, teaching children about the shapes is fun and easy since shapes are really all around us! Or, look for stickers in specific shapes. Circles and stars, of course, are easy to find. But office supply stores or craft stores can also be resources. Allow your child to create an abstract design using the stickers. Suggest to your child that he use only one shape per page to highlight that shape. My students enjoyed using the stickers to cover the outline of a giant size of the shape they were studying. I would give them a page with a circle, square, rectangle or star shape that filled the paper. Then they would use the stickers to cover my dark line, making a fancy shape with the stickers. They loved to “make a star with stars” or a “circle with circles” for example. 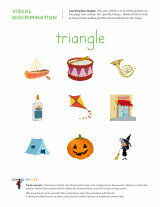 Lastly, you can use some shapes worksheets with your child. Let your child sit at the computer with you and point to the worksheets that catch his attention. He may like the wheels and egg yolks on a circle worksheet or maybe the sticks of gum and hand-held video games on a rectangle worksheet will appeal to him.